As with most people who have a sewing professional life or sewing hobby, I have a collection of fabrics, patterns, and books. Today I thought I’d share my fabric stash organization with you. 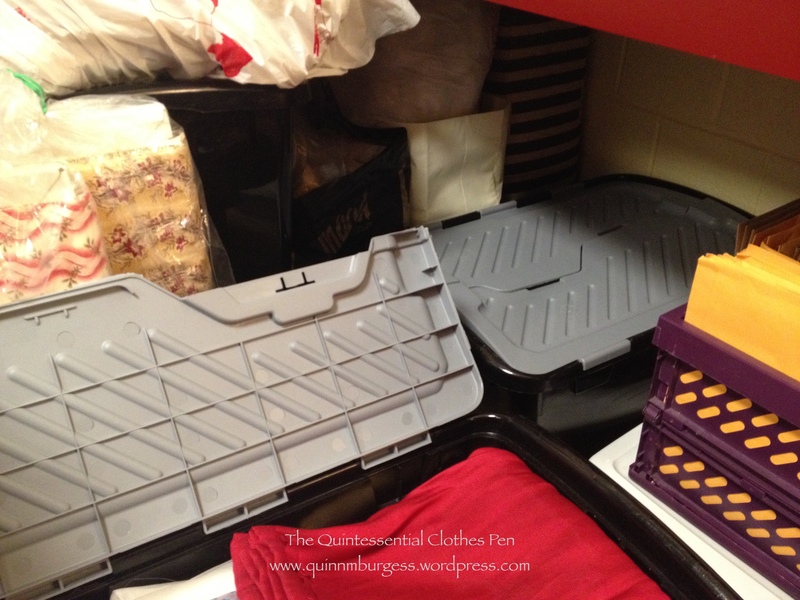 Fabrics are stored in plastic boxes. There’s more fabrics than will fit in the boxes I currently have, so you can see that there are bags piled on top as well, but even the bags are organized! I have some other boxes as well, but this is most of them. The boxes have folded fabrics stacked inside. Fabrics are organized by fiber content. There is a post-it inside each box telling me what categories that box contains. I also have some fabrics on rolls. These stand against the wall. The area between the boxes in the corner is where I keep items I access less frequently, such as lace and trims. These are organized by type in large plastic bags. The large plastic bags are all contained in one large shopping bag. Also in the corner are my millinery flowers. I’ve had multiple opportunities to purchase large numbers of vintage millinery flowers at super cheap prices, so I have lots of them. These only scratch the surface! 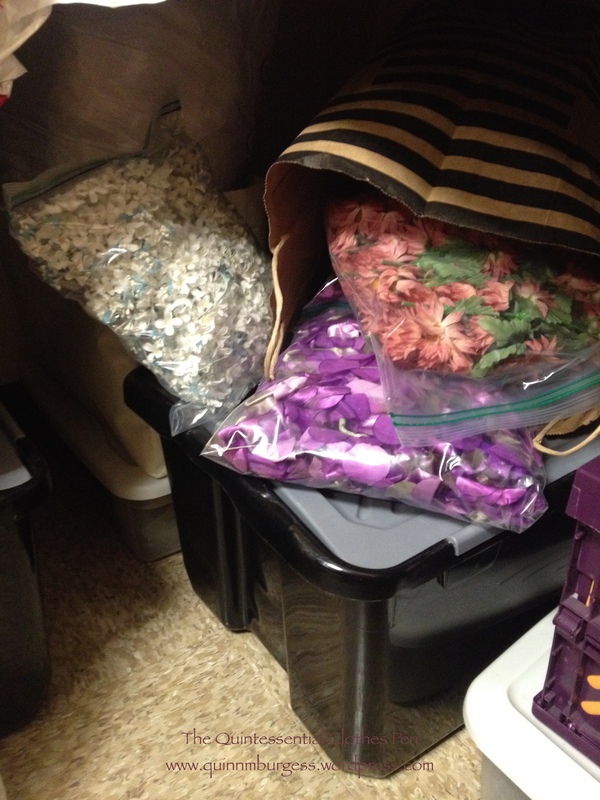 The flowers are organized by type (if I have tons of the same exact flowers) or color in plastic bags, which are then either contained in plastic boxes or shopping bags (once I ran out of plastic box space!). When I first made this system, I tried to remember what was in each box. (I don’t label them on the outside. *) As I went along though, opening multiple boxes to jar my memory just wasn’t working out. So I simply wrote a list of which boxes have which categories and stuck it in the front of my swatch book. My cheat-sheet box content list. Ah ha, but I haven’t mentioned my swatch book yet! This is probably the best organizational part of my stash organization. 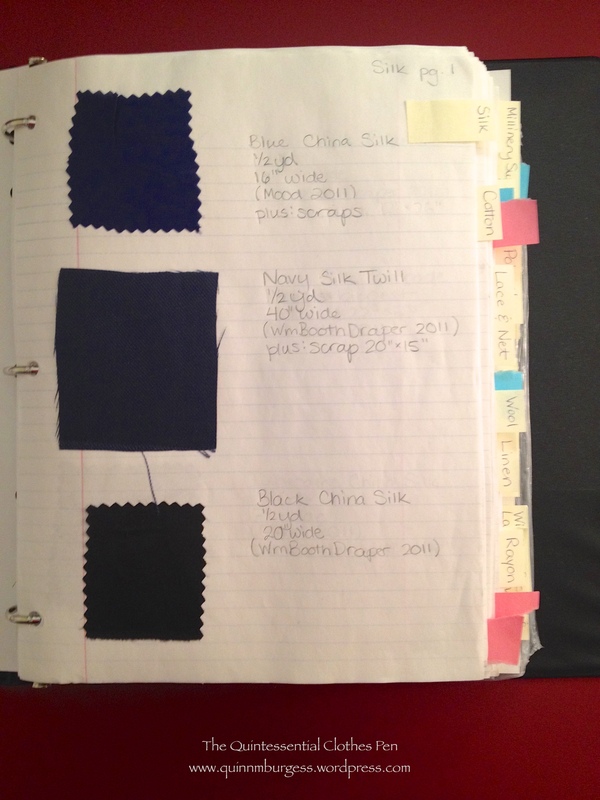 My swatch book is a binder full of information on every fabric and trim that I own (or most of them… sometimes new ones take a bit to make it into the binder). 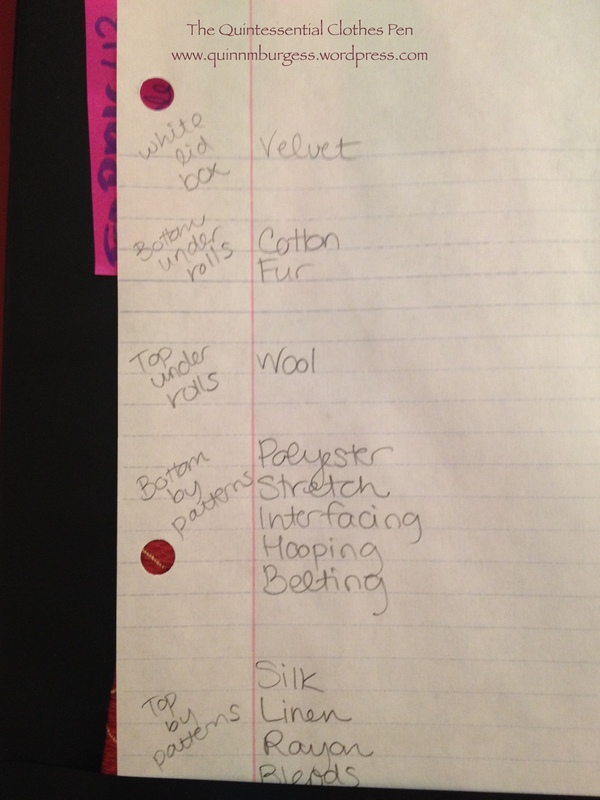 I just add pages as needed to each section as I log new fabrics and trims. The random blue and pink post-it bits are marking the pages where I’ve removed one of the fabrics from my stash and brought it home to work on a project. That way I can keep track of what is in boxes and what is at home. Page one of the silk section. 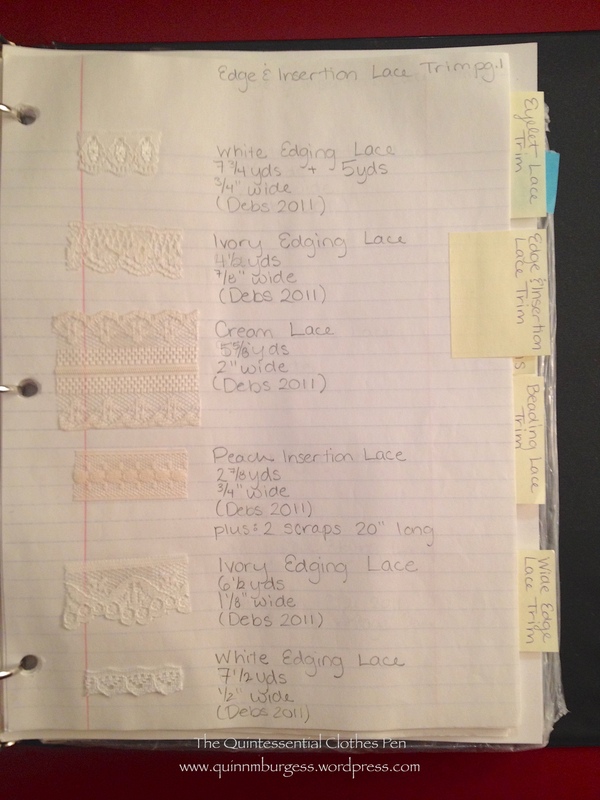 One of the lace pages. 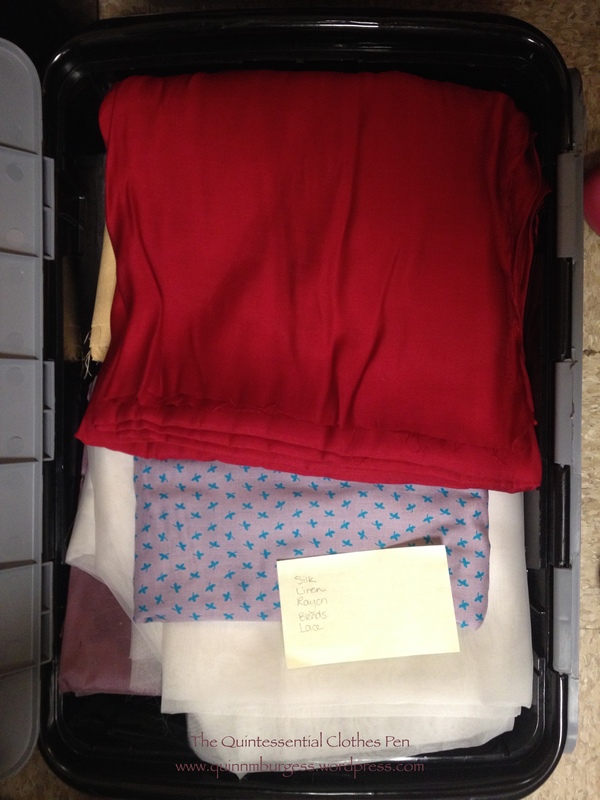 It’s quite a great system, because I can take my binder home with me to consider options and ideas without having to drag out fabric yardage. 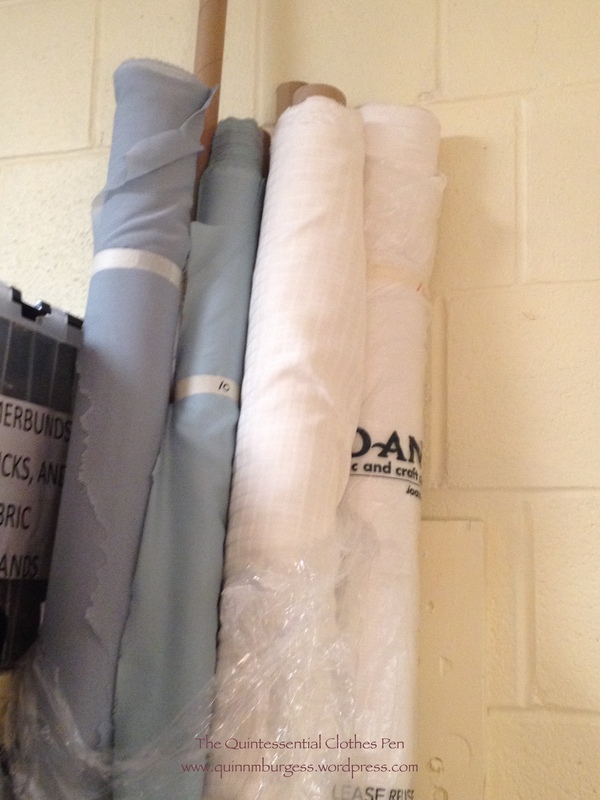 I can also see at a glance if I have enough of a fabric or trim for a project without having to measure. It did take some time to set this up, measuring everything and taking swatches, but now that it is set up it is very easy to maintain. Even if I stored everything in an easily accessible location I would still appreciate my swatch book system! *I store all this in my office at work. The room is actually a converted star dressing room, so my desk is a makeup counter. Unlike most offices, where boxes of fabric might be obvious, out of place, or unacceptable, my office is essentially a fabric/trim/jewelry/accessory storage closet even without my personal items, so more boxes and more fabric aren’t out of the ordinary at all, and since it’s technically my office I can store whatever I want in there. Also, I spend very little time in my office and hardly ever do work in there, so lots of space devoted to even more fabric, etc. is not a big deal.) Also, because my “office” is a general storage space with labeled boxes that other people are allowed to access, I choose not to label my personal boxes to make it clear that no one should be digging through them. That’s also why the boxes are opaque. 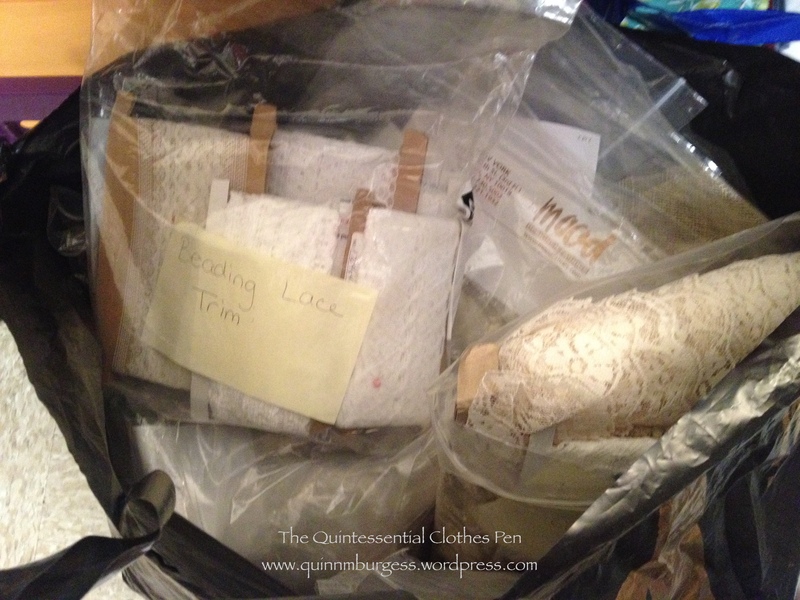 This entry was posted in Costume Construction and tagged Fabric, Organization, Trimmings. Bookmark the permalink. 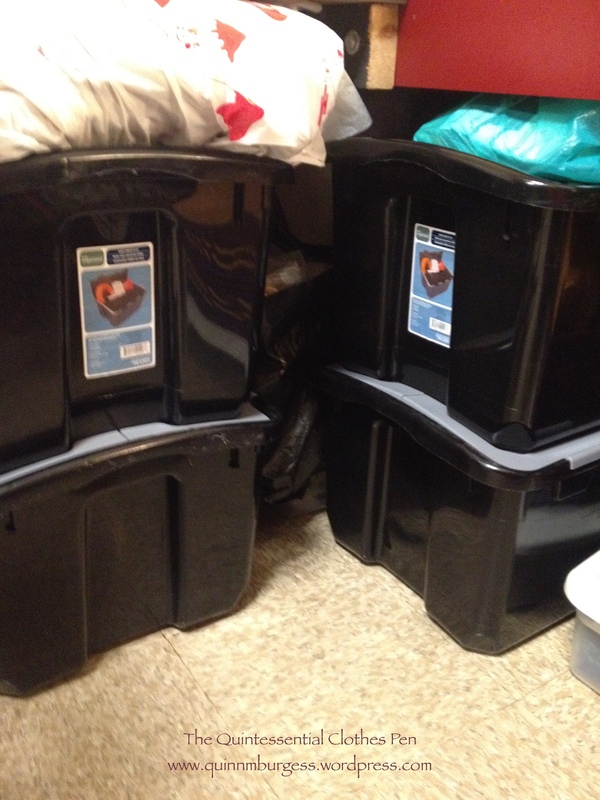 I was also considering plastic boxes for my stash, but I could not figure out wether to buy clear or coloured ones. The coloured ones protect the fabric from sun bleaching, but I love to see my collection for inspiration. I have a Excelsheet which contains measurements and photos of the fabrics I own, but your book might be a good idea as well. And it could overcome the coloured box problem! I’ve had similar thoughts on doing the sample book of trims and fabrics, though I haven’t done it yet! I saw one at the Colonial Williamsburg milliner and have been thinking of starting my own but haven’t found the time. I’m trying to whittle down my stash. Silly me! I was going to suggest the listing of what’s in each box. I saw that idea in a book but you thought of it. Great! It does take time to set up swatch book, but it also helps you use your stash, because you have a better idea of what you have. I really enjoy mine! The past few days I’ve been cleaning and reorganizing my art studio so your post came at a great time – even more so because today I’m buying more storage bins and trying to consider how everything will function. Thank you for the ideas and inspiration!